Every autumn since I came to Japan, a few things have been constant. One is the fact that McDonald’s always has the Tsukimi Burger. It is a basic burger with an egg, bacon, and special sauce on top. The other is the autumn flavour beer. Of course you can’t really get a flavour from a season but the flavours are said to invoke the feeling of autumn. 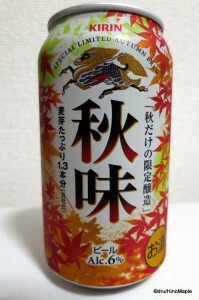 Since 1991, Kirin created a buzz with their “akiaji” beer in the autumn. Akiaji (秋味) is simply translated into autumn taste. Kirin was the first brewery to create and market autumn flavoured beer and it was a hit from day one. Many people enjoyed it and it was a strong seller during the autumn season. This lead to Asahi following suit in 1994 and recently Sapporo joined ranks with their own autumn inspired brews. It is very much a trend that Kirin created and will probably keep going for a long time. All of the major brewers in Japan have tried producing autumn flavoured beer at some point in time but Kirin was the first to market with it. Every year I tend to have at least one can of this beer and it is always interesting to drink it. For me it tends to be a bit more robust in flavour. It is a darker beer with a bitter aftertaste. It isn’t for everyone and it will definitely get you drunk faster than the regular Ichiban Shibori from Kirin. 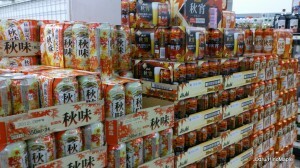 At 6% alcohol, it is a little stronger than regular beer in Japan. If you are a fan of darker beer such as ales, you will enjoy the autumn flavour beer more than the regular lagers within Japan. The only problem with the Akiaji Beer is that it comes out at the tail end of summer these days. Having been released around August 22 this year when temperatures were hovering around the low to mid thirties, it is unbelievable that people consider it autumn. I remember a time when people worried about wearing white after Labour Day but for Tokyo, and most of Japan, the idea that autumn starts at the end of August is just unbelievable. People talked about how they enjoy seeing the autumn foliage in the autumn but it usually doesn’t start until the end of November or early December for Tokyo. Even in Canada where the temperatures are colder the autumn season doesn’t start until September and is fully underway in October. It is a bit of a rant but the fact that I am still sweating and need an air conditioner to feel comfortable makes it a scary thing to think that autumn has started already. In doing just a little research on autumn, I did run into a very crazy idea that the East Asian solar term states that autumn starts around August 8 until around November 7. Perhaps this is where they got the early start, but I digress. I still turn my nose up at the establishment I call marketing and to some extent the solar term and hope to enjoy summer a while longer. Getting back on topic, it is a bit ironic that Akiaji Beer is in stores at the tail end of summer and is usually gone by the time autumn is in full swing. I guess I’ll be on to better things by then anyways. This entry was posted in Food and tagged Akiaji, Asahi, Autumn, Autumn Beer, beer, fall, food, Ichiban Shibori, japan, Kirin, Kirin Akiaji, Kirin Autumn Taste Beer, Sapporo, summer by Dru. Bookmark the permalink. But it’s a pity that it is sold in such a limited time frame. Earlier this week I read in a British newspaper that some Tesco branches have already put up Christmas decorations. (@_@) It’s supposed to be 12 days of Christmas, not 100+ days! Maybe everybody’s so tired of summer and its exhausting heat that we’re trying to pretend it’s already autumn. Or Christmas. You’ll be on better things when REAL autumn is here? 😀 Like … sake? Christmas in September? I know they ship Christmas goods around this time, but to have decorations up now? What happened to Halloween? Halloween was round about Easter. Autumn beer is closer to Western beer, but still not good enough. Japanese beer isn’t all light. You have to start heading into the independent brews to get the darker stuff, but there are places for it. I heard there is a nice place in Ryogoku that has dozens of small name beers on tap. Gotta go there someday soon. Have fun with the umeshu.